Going to the market on a Sunday morning to eat tacos de birria for my father was a must. There is this guy that has a “Carreta de Birria” in “Los Globos” vegetable market in Ensenada and according to my dad, he makes the best birria in town, although nowadays there is a big proper restaurant called “Birrieria Guadalajara”, all they do there, yes! 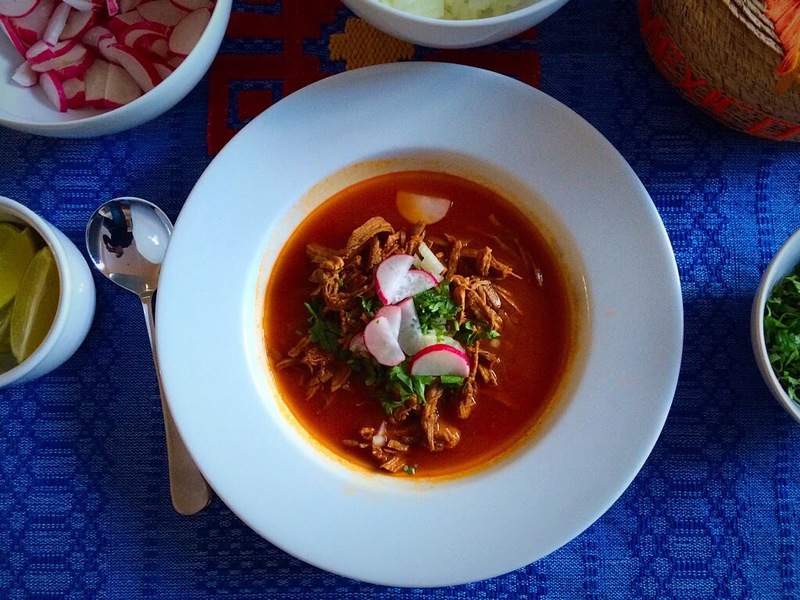 you guessed!, is birria and they always fully booked. I have been there and let me tell you, they do DO a great birria. But you are probably wondering what “Birria” is!, well, It is a spicy stew from the state of Jalisco. The traditional Birria is made with goat meat or mutton, but in my house we always use beef. Traditionally is garnished with coriander, onion, radishes, lime juice and spicy salsa, but I love putting some lettuce in mine, as I really like the freshness this one adds to the birria. It is a heavy dish, very good for hangovers, it is the typical dish that I would call “levanta muertos” (getting up dead). In Mexico birria is usually prepare for special occasions like wedding, XV años, Christmas or New Year’s Eve, but I made mine the other day because I had some friends for dinner and I wanted to impress them. Now let’s get to business and let me give you the recipe. Put the meat, bone marrow, tomatoes, onion and garlic to cook with just enough water covering the meat, add salt to taste. Cook for around 1 hr. then set aside. Soak the chillies in hot water for 5 min and put them in a blender together with the tomatoes, onion and garlic from the meat. Pass the sauce through a sieve to get rid off any skins. Set aside. Shred the meat and cut into small pieces, so when your guests are eating the birria do not get long pieces of meat. Put the meat back into the broth, remove the bones and add the chillie sauce and all the spices (bay leaves, cloves and thyme). Add the tomato purée and cook for around 1 hr or less. Check the salt, if it needs more salt, add at this stage and continue cooking. Remove all the spices before serving. Serve it in a bowl like in the picture, garnish with coriander, onion, lime juice, radishes and enjoy with some warm corn tortillas. Aw! Gracias ?. En mi casa siempre la hacemos de res, pues mi mamá encuentra el sabor del chivo muy fuerte y le ponemos tomate para que atenúe el sabor del chile. I s there an alternative to skirt steak? It seems difficult to find in my small provincial Swedish town. Hi Magnus, you can use brisket as well, chuck roast or flank steak, any of those cuts when they are cook for long periods of time they can be shredded quite easily. Have a lovely evening.